Being triggered and feeling the urge or compulsion to self-injure is something that happens to a person; it’s not something they have control over. Contrarily, the act of self-injury doesn’t happen to a person, it is something they choose to do to themselves to cope with emotional distress. Acknowledging this choice is a positive and powerful step on the road to recovery. So much in life is out of our control. Things happen to us, sometimes terrible, catastrophic things, and there’s little we can do about it. We cannot help being triggered, we cannot control the urge to self-injure. What we can do is control how we react and how we manage the distress that these things cause. Self-injury is a choice, a choice to try to cope and survive. Self-injury is not something that happens to a person, it is something they choose to do to themselves in order to cope with emotional distress. Self-injury is a coping mechanism, a way of dealing with emotional pain that has been caused to us. We are not, usually, responsible for that cause and it is therefore tempting to dismiss our responsibility for what follows. If someone or something triggers us, and we turn to self-injury to release our pain and relieve our emotional distress, it’s too easy to push responsibility for our self-injury back on to the person or thing that triggered it. Nobody is ever responsible for our self-injury other than ourselves. No thing or person forces us to self-injure. Sometimes self-injury can feel like the only option. We might feel that there is nothing else that will help us; nothing else that will work as quickly or as effectively as self-injury. And we might be right! But when we deny that there are alternatives to self-injury that could help us, we are disempowering ourselves. We are removing our choices and we are removing our own control. Whilst at LifeSIGNS we recognise the power behind the drivers that lead to self-injury, and the power that self-injury has over a person, we also recognise that we are each responsible for enabling that power. 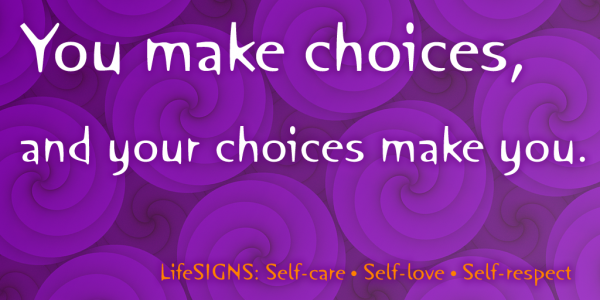 Once we acknowledge that we do have choices other than self-injury, it loses some of its power over us. When we are stuck in a cycle of triggers and distress and self-injury, it can be incredibly difficult to take a step back and recognise the difference between what is happening to us and what we are choosing to do to ourselves. When something bad happens to us we automatically reach for the thing that we know is going to work. Sometimes we do this without even thinking about alternatives; self-injury has become a learnt behaviour that we now rely on. But all behaviours are a choice, and if we stop to a take a breath before self-injuring, and recognise that we are responsible for the continuation of our destructive cycles, then we become empowered to break them. Self-injury isn’t about the tools, the blood, the physical pain. 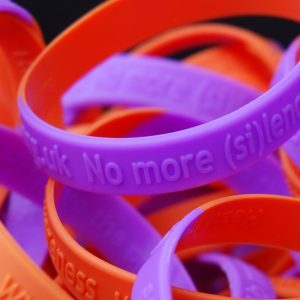 Self-injury is about the abuse, the bullying, the traumatic event, the grief, the overwhelming workload, the pressure, the crushing emotional pain, the anger, the panic, the anxiety, the mental illness. To move away from self-injury we must focus on the cause of our pain. We need help and support for the things that are leading to our self-injury. We cannot be expected to leave our coping mechanisms behind if we are unable to handle the difficult situations that are causing them. Recovery isn’t just about choosing to move away from self-injury; primarily it’s about choosing to seek help for the the things that we cannot cope with. And to coincide with that journey, we can gradually choose to also move away from self-injury. Accepting that self-injury is a choice is self-empowering because it opens up the possibility of alternatives, that otherwise we are denying ourselves. Just because we’ve chosen to have a cup of tea every morning for years, doesn’t mean that one day we can’t choose to have coffee instead. We can only have coffee if we’ve already decided that drinking tea is a choice, and that we could choose something else, and so we keep coffee in the cupboard as well. Just in case. It might take a long time before we decide to have a coffee, but we’ve given ourselves the power to have coffee whenever we wish. It’s similar with self-injury. If we open ourselves up to the possibility of other choices, we are empowering ourselves to make healthier choices. We might choose distraction techniques, or alternatives to self-injury, or we might choose to visit our ‘read this first’ page before we resort to self-injury. All of these choices are available to us. We don’t have to take them; but at least we have the choice! Eventually it can become a physical addiction, because of the chemicals that are released it the brain, endorphins, dopamine, etc. , so your body craves that just like any other drug. The only way your mind knows to release those is through hurting yourself in some way. It is a strong addiction that can be hard to break, just like the tool to use it as a coping mechanism in situations. A self injurer for many years. If we model self-injurious behaviour as a coping technique (a learnt behaviour) , we can see that new coping techniques can be learnt. We prefer to avoid the addiction model as then we’d have to debate the famous ’12 steps’ to recovery. I guess I’m what you would call a long-term self-injurer (over 10 years). I’ve been through ridiculous amounts of therapy. I guess one would say I have Borderline Personality Disorder. Regardless – I reckon I’m quite functional, and I’ve always said that I might be insane but I’m not irrational. What I mean to say is that I don’t understand why I should stop. I realise I have other choices. Sometimes I use them because I think they will make me feel better. It isn’t that I never go for a run instead, or call a friend instead, or pet my cats instead. But sometimes I want that feeling of being absolutely in control of what happens. And I guess this is another “deviation”. Ten years ago when I started, self-injury would often have been an impulsive decision. Now it is very intentional. I trained to be a HCP; I don’t practice for various reasons. But I think I certainly know enough about anatomy and sanitation to be safe, and also to minimise risk to others (disposing of used blades in a responsible manner, for example). Given the above – why should I stop? The assumption seems to be that self-injurous behaviour is always detrimental to well-being. I really doubt that. In my mind, the pleasure I get out of SI (when I do it) outweighs the physical harm – so the “net” result of that is a *benefit*. What are bodies for, if not to be used in a way that maximises our well-being? (Unless the argument is that I am not competent to decide what is in my own best interests? Again, I would have to doubt that.) I can’t take my body with me when I die – I feel entitled to get what enjoyment I can out of it while I’m alive. We never tell anyone to stop. We focus on self-injury being a coping mechanism. A way to gain relief and release from overwhelming emotion. As a coping mechanism, it’s about gaining wellbeing. It’s a maladapative coping mechanism rather than an adaptive coping mechanism, but it’s a coping mechanism all the same. ‘Enjoyment’ is a difficult word. Relief and release are words we focus on. Why is it considered a “maladaptive” coping mechanism? If I understand correctly, everything required to obtain relief from self-injurious behaviour is inbuilt in our neurobiology. Why is it there if we aren’t meant to make use of it?